Heat oil in a large pot or skillet over medium heat. Sauté onions until tender, about 6 minutes. Add garlic and sauté until fragrant, about 1 minute. Add butternut squash and stir to coat. Add the white wine and ½ cup of the vegetable broth. Simmer until squash is almost tender and liquid is absorbed, about 20 minutes. While squash cooks, bring remaining broth to a boil in a separate large pot (add water if necessary to have enough liquid to boil the pasta). 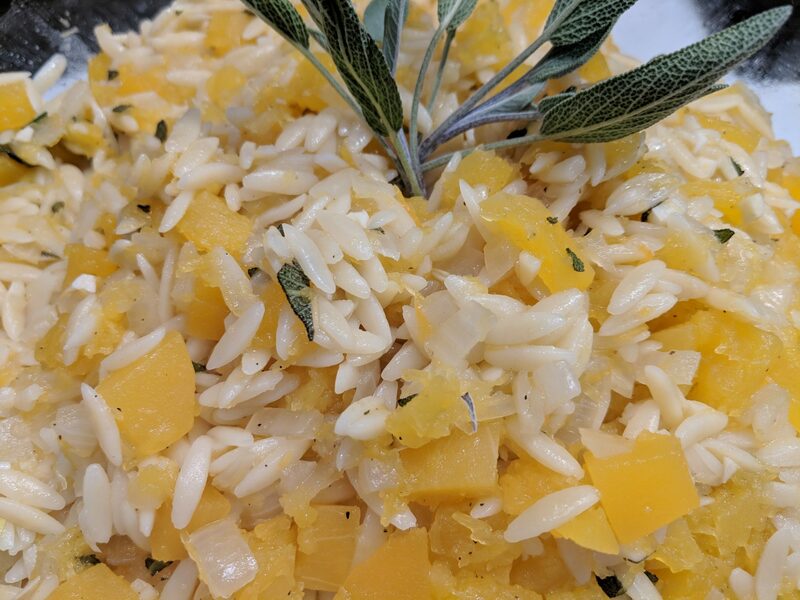 Add orzo. Boil until tender but still firm to bite, about 8 minutes. Drain. Transfer to large serving bowl (or return to pot) and stir in squash mixture. Stir in cheese and sage. Add salt and pepper to taste. Enjoy!